The application is open until December 10, 2017. Two of the elements of the Cabibbo-Kobayasha-Maskawa quark mixing matrix, Vub and Vcb, are extracted from semi-leptonic B decays. The results of the B factories, analysed in the light of the most recent theoretical calculations, remain puzzling, because – for both |Vcb| and |Vub| – the exclusive and exclusive determinations are in tension by about 3σ. This discrepancy has survived several independent checks and could be an indication for New Physics. Further, measurements in the tau channels at Belle, Babar, and LHCb show discrepancies with the Standard Model predictions, pointing to a possible violation of lepton flavour universality. LHCb and the upcoming experiment Belle-II have the potential to resolve the issue in the next few years. 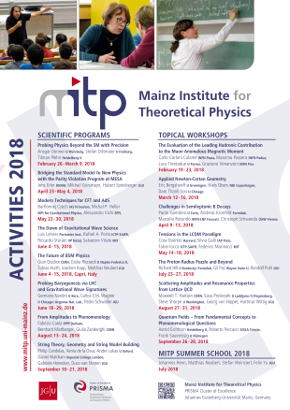 The proposed workshop follows a first successful MITP workshop held in 2015, sharing with it the goal to develop a medium-term strategy of analyses and calculations aimed at solving the puzzles. We plan to have lattice and continuum theorists working together with experimentalists to discuss how to reshape the semi-leptonic analyses in view of the much higher luminosity expected at Belle-II, searching for ways to systematically validate the theoretical predictions in both exclusive and inclusive B decays, and to exploit the unexpectedly rich possibilities at LCHb. In this second workshop, we will focus on the expanding prospects of semi-leptonic decays at LHCb, on the implications of the first Belle-II data, on the possible violation of lepton universality, as well as on progress in lattice QCD, where first simulations treating b quarks like light quarks may become available. As the theoretical methods used to predict rare semi-leptonic transitions b → sl+l-, which could provide evidence for new physics, are the same as those used for semi-leptonic decays, we plan to cover some of their QCD aspects as well.